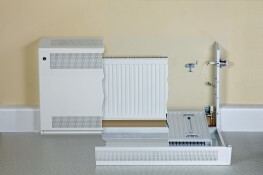 Contour Heating Products Ltd > News > How Do I Convert My Radiators To Be LSTs? How Do I Convert My Radiators To Be LSTs? LST radiators offer several safety benefits that make them appealing to schools, hospitals, care homes and other commercial spaces where vulnerable people are moving around. They help to prevent the risk of burns and scalds from hot surfaces by reducing the surface temperature of the radiator cover. Spaces looking to convert their radiators to a low surface temperature solution often come to us to find out the options around creating safer heating solutions. To answer these questions, we’ve been blogging about how you can convert your radiators to LST radiators and create safer heating. 2. Cover existing radiators with LST radiator covers. Installing new LST radiators means replacing existing radiators with new. This would require a drain down of the system or a pipe freeze which incurs additional cost. However, with replacement to new LST radiators you get freedom over the size of radiator you choose without losing substantial heat output. Alternatively, you can install LST radiator covers over existing radiators to give you a safer heating solution that removes the risk of burns and scalds from hot surfaces. Installing a radiator cover in a commercial setting is different from installing the ones that you would find in a home. Domestic radiator covers are often made from softer materials such as MDF. They aren’t designed to be the robust solution often required in schools, nurseries and hospitals. These spaces need a durable solution as LST radiators are more likely to take impacts from hospital beds, school equipment and people potentially falling against them. Furthermore, these domestic radiator covers aren’t suitable for commercial spaces due to the large volumes of heat that are lost as a result of the cover. As much as 50% of heat can be absorbed by the solid tops that are typically used a shelving space. In environments such as schools and hospitals where budgets are often tight; optimal heat output is vital. Losing 50% of the heat due to improperly designed radiator covers could prove costly in the long run. LST radiator covers made from steel are a far superior solution for commercial spaces. The robust nature of the material means that in schools and hospitals, there is a durable heating solution that can withstand the pressures of these busy environments. Steel LST radiators have inlet and outlet vents cut into the top and bottom of the cover which allows the heat to circulate into and around the room more effectively. Contour metal radiator covers can also be supplied with RotaRad’s rotating radiator valves to give easier access to cleaning behind the radiator. With full access for cleaning, your LST radiators will become more efficient as they are quicker and easier to turn around. Contour Heating offer bespoke heating solutions to customers to ensure that the LST radiators that we provide are an exact match for their needs. We understand that a one-size-fits-all approach risks an unsuitable solution. This could result in gaps between the LST radiator and the wall, poor aesthetics and improperly fitting radiator covers. This, in turn, creates a safety risk and items could be pushed through the cover and children could catch their fingers in the gaps. We create our LST radiators on a customer by customer basis; meaning that we can ensure that your radiators are the most suitable fit for you, no matter what that is. With a bespoke heating solution, your LST radiators can be installed to be the best match for your space. This includes the colour! Working from a RAL chart we can create a colour that matches the design of the space to make it as aesthetically pleasing as possible. To convert your radiators to LSTs, you can either install a new system entirely or cover existing radiators with LST radiator covers. In commercial spaces, covering radiators with radiator covers that are highly decorative, such as the ones that you would find in the home results in large heat losses. With robust materials such as steel making up your LST radiators, you can feel assured that your heating solution will provide safer surface temperatures, easier access for cleaning and better efficiency.